Pastels are fun and versatile! Pastel drawings and paintings glow with intensely luminous colour and rich texture. Soft pastels are easily blend-able and can be blended with fingers, a blending stump, or a cloth. Unlike the process of painting, the colours are mixed directly on the paper and the colours that are produced, are wonderfully intense. With a lot of notable artists making oil pastels as their primary medium, considering that they are fun to use, just like a crayon soft) !! 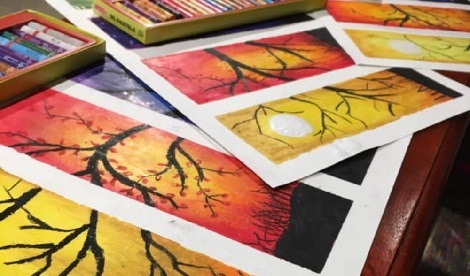 You will learn step by step technique to create a pastel art. Understand and recreate the tonal effects, finger colour blending, shadows & textured shading. No previous experience in art is required. It is applicable for all ages. All materials will be provided to you and you will take back a finished coloured PASTEL ARTWORK. Materials include oil pastels, brushes, pencil, tracing sheet and tinted boards. So come explore the brilliant colours and just dive right in without needing paintbrushes, solvents or a palette. About Kalpesh: Artist by passion and Engineer by profession. Conducting his 116th workshop. Loves to engage and propagate ART.